Whenever I am in the UK and see a Millie’s Cookie Stall, I can’t help myself but buy a large bag of the White Chocolate Chip cookies. 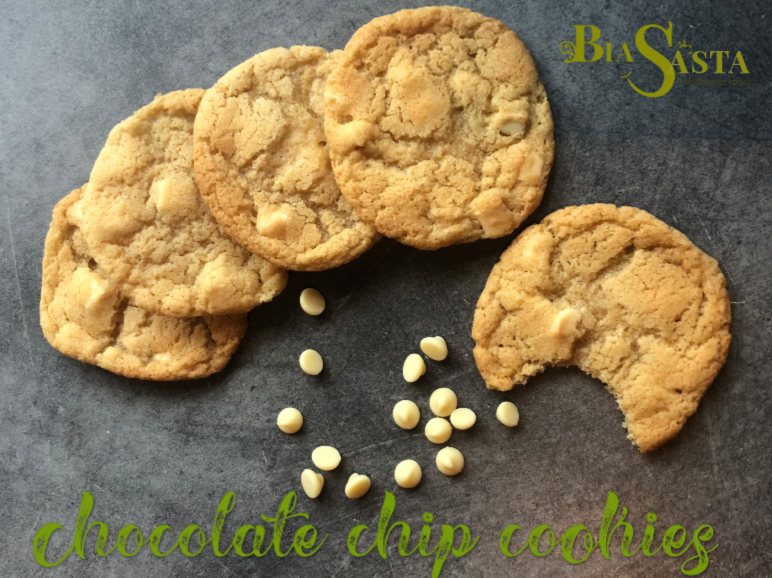 They are rich, soft and gooey – just the way you want a chocolate chip cookie to be. The next best thing is the Marks & Spencer Chocolate Chip cookie. And again, every time I am in town, I have to pop in to see if they have them available – they are selling like hot cakes and if you coming in the afternoon, they are all gone. I thought, what better time to try to re-create the cookie for my weekly cookie challenge. 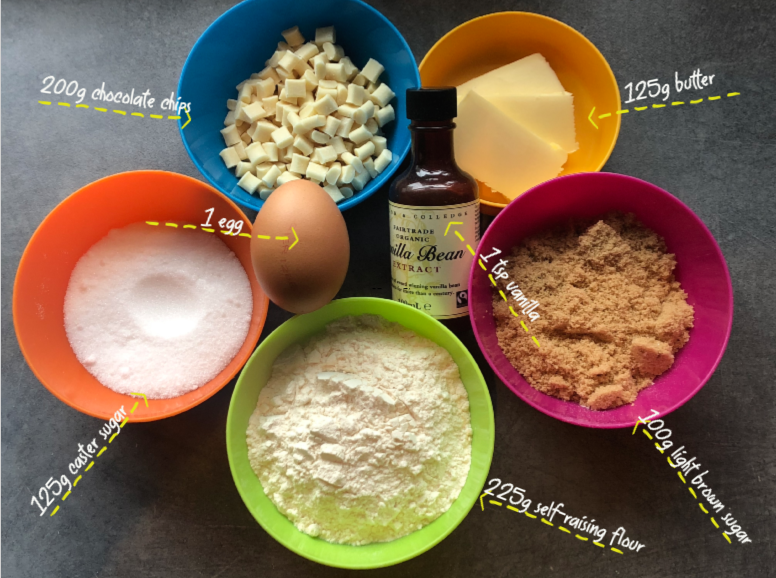 So, here it is: Week 3 of my Weekly Cookie Challenge and I present to you the White Chocolate Chip Cookie (use milk or dark chocolate if you don’t like white chocolate… but how can you not love white chocolate chips). The secret, I figured out, to a good chewy chip cookie is the addition of light brown sugar and to use self-raising flour rather than plain flour with baking powder. The result is as close as homebaking can get to the industrial stuff and I am quite happy how they turned out. Preheat the oven to 180C (make sure you get to the required temperature before placing the cookies in the oven. They spread too far otherwise. In a bowl, cream the butter, brown and caster sugar until pale in colour and fluffy. Add the egg and vanilla extract, whisk until well combined. Stir in the sifted flour, salt and chocolate chips. This is best done with a wooden spoon. You might need your hands to bring it all together but don’t overwork the dough. Roll the dough into walnut-sized ball and place on a baking tray (I always cover my baking trays with baking paper). Press down the dough ever so slightly and place in the oven. Bake for 7-10 minutes. You still want the cookie to be gooey (unless you don’t like gooey cookies – but then we couldn’t be friends). For a more set cookie increase the baking time slightly. Leave to rest on the tray for a few moments before moving the cookies onto a wired rack to cool completely. The outside of the cookie will be nice and almost crisp while the inside is soft and delicious. These will keep in an airtight container for 5-7 days.